Whether you are looking for food, shoes, wine, clothing, bikes or a new haircut, the Noorderboulevard has it all. The Noorderboulevard is basically a long street (Zwartjanstraat) beginning at the Bergweg all the way to the Noorderplein. It’s a shopping street loaded with different kinds of shops selling products like: Moroccan delicacies, sunglasses, shoes and kitchen equipment. In for a fast bite? No worries. All the famous fast food chains can be found on the Boulevard as well, including the Bram Ladage, which is the place to go for a typical Dutch snack. Even though the idea of a boulevard makes you wonder about your last summer holiday strolling along the beach in some Southern European country, this boulevard might be experienced slightly different. The street is packed with little stores, people, cars and motorbikes driving up and down and cyclists trying to find their way in between them all. 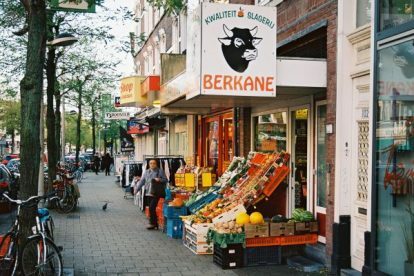 It’s a multi-cultural mix of all that can be found in Rotterdam. I like the street not just because it’s around the corner but also due to the kind of weird but funny atmosphere it has. Start walking down the street from the Bergweg, get yourself a bottle of wine at Chateautjes and end up with a coffee at Hopper or some sweet delicacies at Loft der Zoetheid. So many spots around.